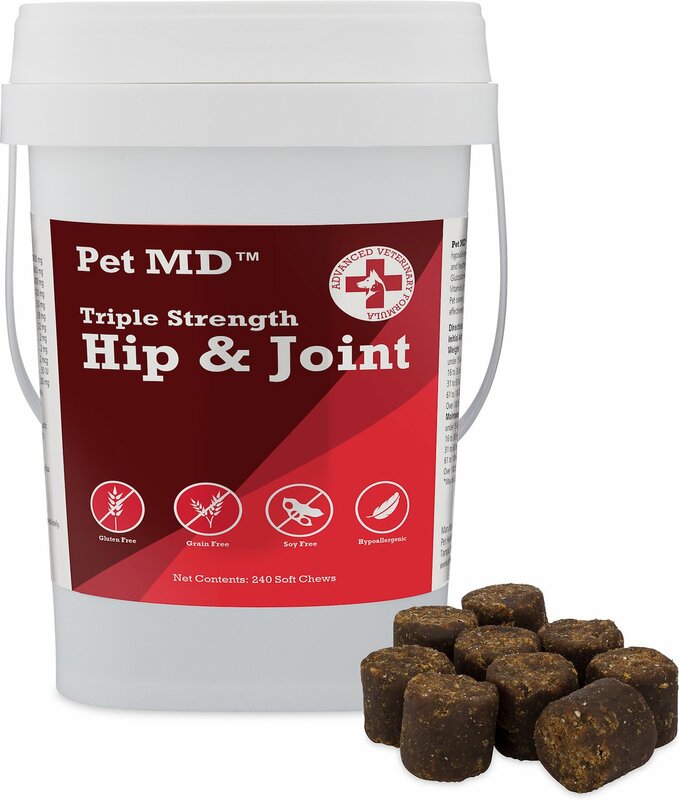 Help support your pup’s joint health and flexibility in one deliciously soft, chewable treat with the Pet MD Triple Strength Hip and Joint Hypoallergenic Dog Supplement. 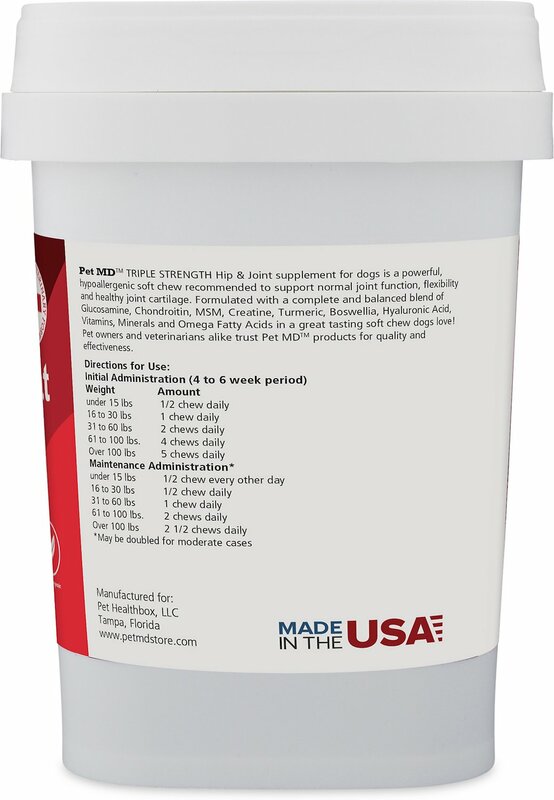 The advanced veterinary formula is like an all-in-one stress reliever for your pup’s joints, working to quell inflammation that can cause pain, as well as helping to lubricate joints and support healthy cartilage with 20 powerful ingredients. It’s formulated to help your pal keep a healthy spring in his step, thanks to its synergistic blend of cartilage-supporting glucosamine, chondroitin, and MSM, and the anti-inflammatory action of omega-3 fatty acids, turmeric, and boswellia. It also contains hyaluronic acid, known to help keep joints lubricated, cushioned, and flexible. Plus, powerful antioxidants like alpha lipoic acid and vitamin C, and superfoods like cinnamon and cranberry help promote healthy circulation and joint function. It’s ideal for senior dogs as well as all pups with achy joint ailments like arthritis and hip dysplasia. Because it contains no wheat, soy, or gluten, it’s also hypoallergenic, making it ideal for pups with sensitivities. 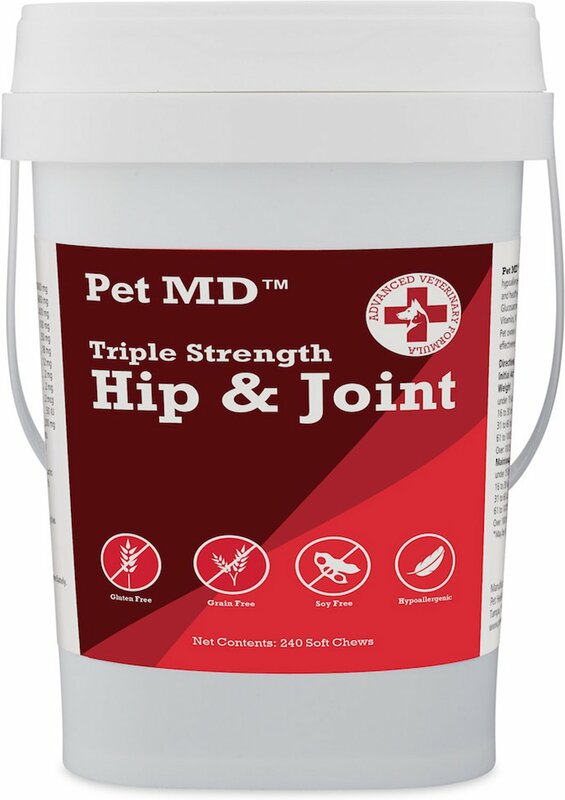 Supports healthy joints with veterinary-strength hypoallergenic formula including glucosamine, chondroitin, and MSM to repair and maintain cartilage. Helps soothe joint inflammation that can cause pain with omega-3 fatty acids, turmeric, and boswellia. 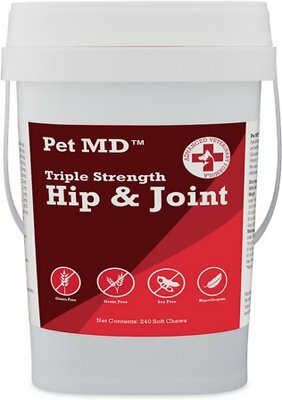 Works to maintain synovial fluid in joints for improved mobility for dogs of all breeds and sizes with hyaluronic acid. Promotes healthy circulation and joint function with antioxidants and powerfoods like cinnamon, citrus bioflavonoids, and cranberry. Made in small batches in the USA in an FDA, USDA and FSIS regulated manufacturing facility, with no wheat, soy, or gluten. For animal use only. Keep out of reach of children and other animals. In case of accidental overdose, contact a health professional immediately. Safe use in pregnant animals or animals intended for breeding has not been proven. If lameness worsens, discontinue use and contact your veterinarian. Safe use in pregnant animals or animals intended for breeding has not been proven. If animals' condition worsens or does not improve, discontinue use and consult a veterinarian. Caution in use with antidepressants. Active Ingredients: (Per 2 Soft Chews) Glucosamine HCl (Shellfish) 1,000 mg, MSM (Methylsulfonylmethane) 600 mg, Creatine Monohydrate 400 mg, Chondroitin Sulfate 100 mg, Eicosapentaenoic Acid (EPA) 18 mg, Docosahexaenoic Acid (DHA) 12 mg, L-Glutathione 2 mg, Ascorbic Acid (Vitamin C) 50 mg, dl-Alpha Tocopherol Acetate (Vitamin E) 50 IU, Zinc Sulfate 2 mg, Selenium 2 mg, Proprietary Blend (Cinnamon, Citrus Bioflavonoids, Turmeric Root Powder, Boswellia Serrata, Hyaluronic Acid, Alpha Lipoic Acid, Dried Cranberry.) 200 mg.
Inactive Ingredients: Canola Oil, Fish Meal, Flaxseed Meal, Glycerin, Lactic Acid, Lecithin (Sunflower), Mixed Tocopherols, Potato Flour, Potato Starch, Rosemary Oil, Sorbic Acid. My dogs won’t touch them. These chews have a very strong herbal odor, not unpleasant to me, but three out of three dogs won’t touch them. I tried crumbling them in their food, slathering them in peanut butter, and hiding them in a meatball, all to no avail. And my dogs are not picky eaters. They pretty much eat anything not nailed down. Even my picky eater was a fan! I was worried that it would be a daily battle to get my picky GSD to take this supplement. It was recommended by a friend so I decided to give it a try anyway. Turns out he loves them! In the evening he knows when it’s time to take them & he even gets impatient if I’m not on schedule :) These are on auto ship for us now- my guy is now middle aged & anything I can do to keep him limber & healthy for a long long time is a no-brainer. Um sorry my dogs didn’t like these and they smell very herbal. Too early to tell if these work for our 10 year old Blue Heeler. He has joint issues. He likes them, but only if I crumble them up for him. We started him on these 2 weeks ago - 1 twice a day. I want to say it looks as if it’s easier for him to get up now. We shall see. Great product with a good price tag. The dosage is awesome you dont have to give a bunch even for large dogs. I only gave it a 4 because most of my dogs won't eat it, so I have to mix it into the food. It smells horrendous. I was not even able to hide it in cheese or meat. been giving my dog two of these twice a day and she loves them. Seems to be working for her. She has a bit of a peep in her step now. I have a Chihuahua that will eat anything, and I mean anything. For example when we walk up my country road, she will eat dropping from the wild animals. If a cat goes in my flower bed she will eat it. I have tried everything to get this dog to eat these treats and she will not !